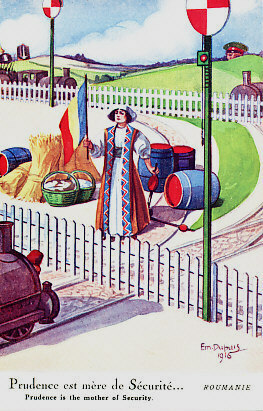 Neutral Romania, personified as a woman in national dress, raises the Romanian flag before her wealth of wheat, baskets of bread, and barrels of food and oil, barring the path of a train from which a Turkish fez peeps. 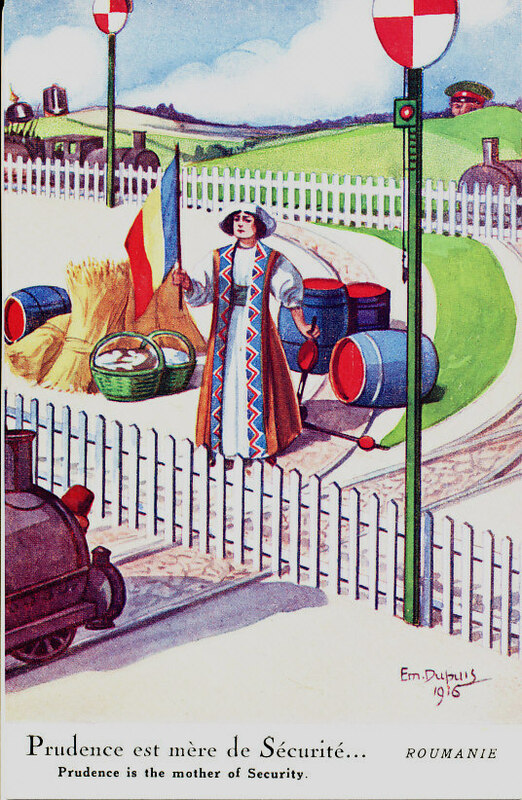 The illustration is not geographically accurate, as Romania did not share a border with Turkey, but did (and does) with Bulgaria, her southern neighbor, who peers over a hill to the right. Over Romania's right shoulder, the spiked helmet of Germany and shako of Austria-Hungary rise above the horizon. By Em. DuPuis, 1916. Romania formally set aside the prudence referred to in the caption on August 27, 1916 when she declared war on Austria-Hungary; she was soon at war with Germany, Bulgaria, and Turkey as well. Like Italy, neutral Romania was courted by both the Entente Allies and the Central Powers, with each side offering the opportunity of winning Romanian populations in foreign lands - in Transylvania, Austria-Hungary, and in Bessarabia in Russia. Romania was more interested in Transylvania, and in supporting Italy with which it had close linguistic and cultural ties??? With the success of Russia's Brusilov Offensive, driving Austria-Hungary from its northeastern provinces, Romania concluded the time was right to enter the war. The Allies tried to obtain Romania's help in attacking Bulgaria which had defeated Allied attempts to assist Serbia when it was being overrun in 1915. Romania had two war plans, one aligned with the Allies' desire for the attack on Bulgaria, the other in line with its ambitions for an invasion of Transylvania. Declaring for the Allies, Romania pursued its ambitions, crossed the mountains separating it from Austria-Hungary, and entered Transylvania the night of August 27, 1916. Germany had been aware of Romania's preparations for war, and begun assembling new armies in Austria-Hungary and Bulgaria. On August 28 Germany declared war on Romania, and a Bulgarian army under German command crossed into Dobruja, the region in eastern Romania on the Black Sea. 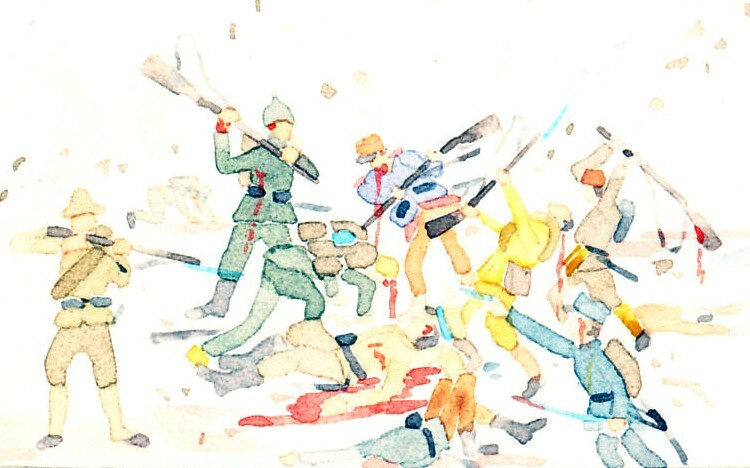 Within days, Russian troops came to Romania's aid, and helped turn back the Central Power advance.